Of Faust’s dozens of memorable images, big and small, comic and tragic, harrowing and absurd, it is for me the looming, bat-winged shadow of Mephisto over a medieval town that means the most. In terms of plot, this is the moment when the king of demons (Emil Jannings) unleashes Plague upon the town; a scourge intended to be so virulent that it will drive the town’s foremost wiseman, Faust (Gösta Ekman) to bargain with the Devil for help. This is really Mephisto’s game to lose. If Mephisto can corrupt Faust (so claims his angelic opposite number), then the Earth is his. From an aesthetic standpoint, however, it is this scene which establishes director F.W. 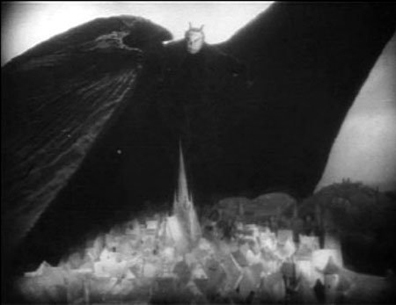 Murnau’s vision for Faust: An overly-dramatic, excessively costumed being, impressing its will over what appears to be toy buildings—a scene of almost impudent fakery. So obvious is the artifice in Faust that I doubt it will wholly draw you in—it never has me, with the exception of a single scene late, late in the film. But Murnau does entrap us, in a way. Through the tricks of his craft, he takes an operatic tale and buries it in a dismal, soundless basement, and us with it. His Faust is a claustrophobic experience, even by Expressionist standards. The hero is a burly figure robed in black with a burst of white hair and beard and fervent eyes. He lives alone in a room cramped with dusty books. He is learned, and sober. Faust is the one the townspeople turn to when bad things happen. There is no sign of town officials or doctors in a modern sense once the plague starts felling the population, only nihilistic revelers and end-times preachers—both panicking and dying—and Faust, pushing purposefully past them to tend to the sick. We see him fail an old woman, who dies with her daughter wailing over her. Faust, in a gloom, curses his powerlessness; returns to his hovel, and begins burning his books. 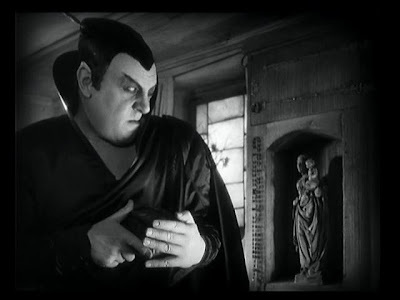 Faust abandons that which sets him apart from the mob, becoming vulnerable to their superstitions. He saves one book—the very worst book he could choose—one containing an incantation that summons the Devil. Repairing to a crossroads, Faust performs the ritual to flashes of lightning and rushing winds and throbbing rings of light and all is a great torrent and then, from a burst of flame, a squat little man appears nearby, and raises his hat. Faust flees, but wherever he goes, the little man is waiting, grinning, greeting. Soon, he will trade his peasant-garb for black silk robes, a sharp-pointed cap with a very long feather, and a nobleman’s sword. Janning’s Mephisto is a dandy, really, and entertaining. He produces a contract for the old man to sign (written in fire, on parchment) giving Faust healing powers for a day; but by day’s end Faust desires to be young again; to live the life of debauchery and pleasure he’d always denied himself. And suddenly, his old man’s face is stripped away. Ekman, despite his tremendous physical beauty, proves bland. He spends most of the film passively grim while more interesting things draw our attention elsewhere. 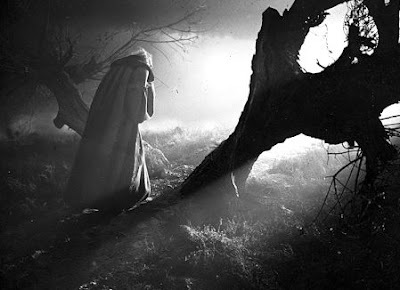 Even Murnau ignores him for long periods, weakening our connection to Faust and encouraging us to focus on the scenery and secondary characters even more. Perhaps this was supposed to give Faust depth by default? Many scenes look like Faust must feel—ceilings are low; rooms are cavernous, dim; shadows are heavy; objects, furniture, even other people crush together in the frame. The sky seems overcast, always. Smoke billows, obscuring not just the characters but everything around them, too. If you were hunkering down, searching the floor, peering out at the world through fingertips, this would be the world you’d see. And I do believe it’s the world Faust sees. Mephisto is both Faust’s id and his superego. He’s more than willing to suggest new temptations and methods of sating them, yet, when Faust happens across a beautiful young woman named Gretchen (Camilla Horn), it is Mephisto who pulls him back. “An innocent little girl, running to a priest…she is not for you!” he scolds. True, it’s not in the Devil’s best interest to have Faust consorting with pious types, but this line sounds less like Mephisto and more like Faust’s guilty conscience. This—call it ‘dispersal’—of Faust’s being, with the environment embodying his conscious mind and Mephisto his subconscious, leaves the character as little more than a being of pure action, most of it brooding, and very little of it sympathetic. Instead, it’s poor Gretchen, brought down by an uncertain combination of Mephisto’s magic tricks, her desire for another’s touch, and the disgrace that results from it, who generates the real pity. Gretchen’s crawl through the snow, precious parcel in arms, is absolute melodrama, but it works because it could happen, and because the circumstances touch us on a primal level. It’s the most moving scene in Faust, but it could also have been part of any other movie and worked just as well. 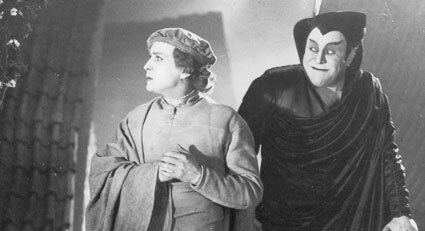 Recalling Faust is like taking the role of that mighty archangel, peering down from Heaven on a world made of trinkets. The angel observes and assesses, but does not emote. He sees the intricacies of human society and appreciates it enough to value one such as Faust; yet he can still, casually—bloodlessly—wager with Satan for the whole race’s fate. I appreciate what Murnau set out to do, and the results are a visual tour-de-force, but I could never invest in the people. I could never descend and be among them. 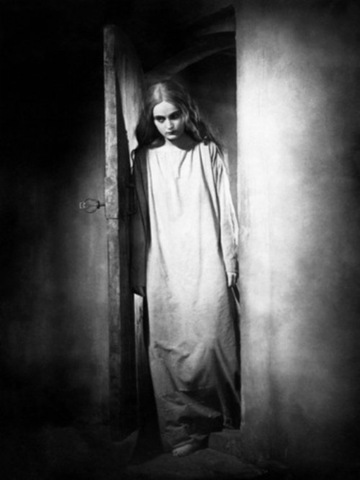 Faust was screened live on April 2, 2011, as part of the Toronto Silent Film Festival. Accompaniment was provided by Robert Bruce. The film is available on DVD from Kino International. Fine post. I have the Kino edition and love it for the visuals (with Murnau, one can always, at the very least, count on that). Thanks Mykal. I appreciate the exposure. You should try to find a copy of Murnau's JOURNEY INTO THE NIGHT, if you can. An interesting early work.